Special Holiday Promotion: Chinchilla Millennia Entertainment Set on the Auction! Special Holiday Promotion: Chinchilla Millennia Entertainment Set! This week we have a Special Holiday Item on the Auction. This entertainment set is being offered with no reserve, and a $1 minimum starting bid. The seven piece set includes one wine bottle circlet, and six wine glass charms. On the circlet is a Chinchilla Millennia IV miniature sterling silver sculpture. 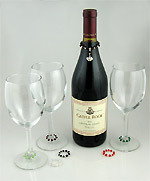 The six matching wine glass charms allow guests to identify their wine glasses at your dinner party or social gathering. This elegant set is suitable for formal or casual events, and is made of sterling silver and Swarovski crystal. This is a highly collectable one of a kind set. More Information. We receive many nice pictures from our clients around the world. We thought that the Newsletters would be a good place to share some of these pictures and the stories behind them. A very beautiful chinchilla, called a ‘Dragon-Cat’ in China, was recently born in Shanghai. His breeder named him Olym, to celebrate the 2008 Beijing Olympic Games. Olym was born on 08-08-2008, which is also special because in China the number 8 is a very lucky number. Olym was sired by a Black Velvet Royal Persian Angora, and is out of a White Mosaic Royal Persian Angora purchased from Chinchillas.com in 2007. When this picture was first sent to us, the term ‘Dragon-Cat’ really sprang to life! In the Chinese language, there is no specific word for ‘chinchilla.’ The literal interpretation of the Chinese phrase for chinchilla is ‘Dragon-Cat.’ The word ‘Dragon’ is equal to ‘King’ and ‘Emperor’ in ancient China. Only the royal family can use anything with Dragon artwork. Dragon is the most sacred animal that only serves the God in heaven. Ancient people believe the king/emperor is the son of the God and that’s why the emperor is the only one who can be honored by the Dragon. One of the main reasons Chinese people call chinchillas the ‘Dragon-Cat’ is because the chinchilla is considered king of the rodent animals. Chinchillas also have the longest life span compared to other small animals. So, it definitely qualifies as a ‘Dragon’. Congratulations, Liza, on the birth of your ultimate Dragon-Cat! The Importance of Grass Hay in Your Chinchilla’s Diet. We get calls and e-mails regularly from people asking how much hay they should feed their chinchilla, and what kind of hay is best. In general, a normal healthy chinchilla should be given a clean, dry, good quality grass hay free-choice. Keep in mind that Alfalfa and Clover are not grass hays. Alfalfa and Clover are legumes, and the protein level of legumes tends to be much higher than what a chinchilla should regularly consume. Grass hays include Brome, Timothy, Orchard grass, Oat hay, Prairie hay, Tifton, Coastal hay, and others. It is also best, whenever possible, to offer regular loose hay as opposed to hay cubes. Hay cubes are better than no hay at all, but chinchillas tend to consume more hay when it is fed loose than when it is fed in cubes. Chinchillas are healthiest when they are kept on their natural high roughage diet, and having access to good quality grass hay at all times allows them to stay on such a diet. ( Please note that in addition to grass hay, chinchillas should also be fed a high quality chinchilla specific pellet like Tradition, Mazuri, or Oxbow. ) 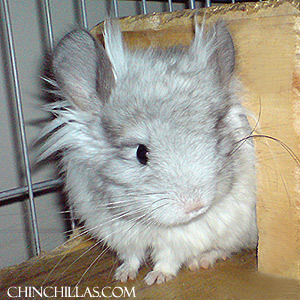 Visit the Chinchillas.com E-store for all of your chinchilla feed needs. Our next export & domestic shipping date is Monday, December 8th. Orders for the December 8th shipping date will close on Wednesday, November 26th. This will be our last shipping date until after the winter temperature embargos. We will resume exports & shipping in March 2009. ... is now available in the Chinchillas.com E-store! Your personal preferences are set to receive newsletters and surveys from chinchillas.com. To modify your personal preferences and unsubscribe, go to http://www.chinchillas.com/personal and log in to your personal account, select View/edit your personal information then change "participate in survey" to no and "on mailing list" to no. If you have trouble unsubscribing send an e-mail to customer-service@chinchillas.com stating you would like to be removed from the list. Copyright© 2008 Chinchillas.com All rights reserved. Designated trademarks and brands are the property of their respective owners.